Petitions for pardons are usually sent in writing to the White House counsel's office or a specially designated attorney at the Department of Justice. In Libby's case, Cheney simply carried the message directly to Bush, as he had with so many other issues in the past, pressing the President in one-on-one meetings or in larger settings. A White House veteran was struck by his "extraordinary level of attention" to the case. Cheney's persistence became nearly as big an issue as the pardon itself. "Cheney really got in the President's face," says a longtime Bush-family source. "He just wouldn't give it up." And there was a darker possibility. As a former Bush senior aide explains, "I'm sure the President and [chief of staff] Josh [Bolten] and Fred had a concern that somewhere, deep in there, there was a cover-up." It had been an article of faith among Cheney's critics that the Vice President wanted a pardon for Libby because Libby had taken the fall for him in the Fitzgerald probe. In his grand-jury testimony reviewed by TIME, Libby denied three times that Cheney had directed him to leak Plame's CIA identity in mid-2003. Though his recollection of other events in the same time frame was lucid and detailed, on at least 20 occasions, Libby could not recall details of his talks with Cheney about Plame's place of employment or questions the Vice President raised privately about Wilson's credibility. 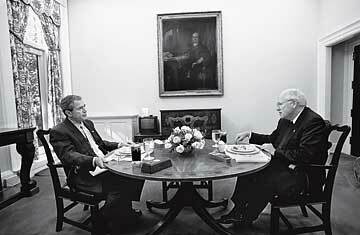 Some Bush officials wondered whether Libby was covering up for Cheney's involvement in the leak of Plame's identity. That meant taking up the pardon question again was, as a West Wing veteran put it later, like passing a kidney stone--for the second time. Bolten declined to take a stand, according to several associates. Instead, he lateraled the issue to Fielding, claiming that a legal, not a political, call was required. If the counsel's office decided a pardon wasn't merited, says an official involved in the discussions, everyone else would have cover with Cheney. "They could say, Our hands are tied--our lawyers said the guy was guilty." And so again the job fell to Fielding. The counsel knew that only one legitimate reason for a pardon remained: if the case against him had been a miscarriage of justice. Because that kind of judgment required a thorough review, Fielding plowed through a thick transcript of the trial himself, examining the evidence supporting each charge. It took Fielding a full week. He prepared his brief for an expected showdown at a pardon meeting in mid-January 2009. The Vice President argued the case in that Oval Office session, which was attended by the President and his top aides. He made his points in a calm, lawyerly style, saying Libby was a fall guy for critics of the Iraq war, a loyal team player caught up in a political dispute that never should have turned into a legal matter. They went after Scooter, Cheney would say, because they couldn't get his boss. But Bush pushed past the political dimension. "Did the jury get it right or wrong?" he asked.